The beginning of our product is a simple story of a very small effort to be “green” in a world of waste, and to use a simple product that 10% was used, and 90% discarded every time. Working as a territory sales manager for a Company based in California, I found myself traveling for business at least 2-3 times per week. In the mornings in the hotel, I would open the “hotel-soap”, use it in the shower and it would be discarded. I started to save the small, thin rectangular bars in a shoe-box size plastic container under the sink in my bathroom. I was thinking of finding a way to recycle the bars into something useable. I thought of “pressing” 3 or 4 bars together, with a constant weight and forming a new, thicker bar. Not much success. 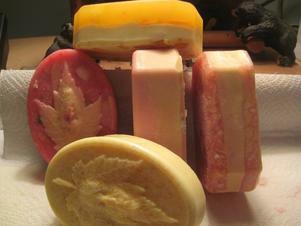 In this process, I found through the internet that “hobby-type” soap bases and accessories were available. I ordered some books, and couldn’t believe the colors, shapes, ingredients, scents, textures and styles that were available. The one thing that I found was that almost every mold and shape was for “guest-type” soap…..very small, cute and for the bar you would find in a candy dish in someone’s guest bathroom. I wanted a big, meaty bar I could use in the shower, and incorporate pieces of all the soaps I had accumulated. My first order was for a 2 lb. glycerin base and a 2 lb. white base block, with a “soap color kit” and a few 1 oz. bottles of color and fragrances. I melted the base in a pot on very low heat, boiled water in another pot, cut up about 20 bars of used soap, dumped the “chunks” into the boiling water to sterilize and soften them, strained them and threw them into the soap base with a few drops of orange dye. I then poured the mixture into the 2 lb. tray the base came in and let it cool. When I finally figured out (after much trauma and trial and error) how to release the soap from the mold, I had a pretty cool looking bar of solid light orange soap, with tons of big, white “chunks”….all in a pretty messy blend….but it sure worked for me. After I cut and trimmed the 4 bars I made, I really liked the results, and felt good about re-using the soap, and since more than half of the bar was from reused, hotel soap, I thought that a pretty good bargain too. I began to experiment with processing lemons, limes and oranges for the soap. I started with zesting a lemon right into the soap base. I tried using the whole lemon, boiled, liquefied and mixed with the base. I tried layering two different mixtures in the same mold. I made a lemon lime bar with half the bar a yellow tint, and half the bar a green tint, as a two-step process…..turned out pretty good!! I no longer use ANY used soap, but I still save the hotel bars….I travel with my own soap in a travel soap dish, and still shave, small-chop or chunk up a few new, hotel bars in each batch I make. I’ve tried some wild blends over the past 10 years, everything from zucchini flowers to thyme, honeysuckle to parsley and pommegranet to vanilla-bean. Nothing you ask for will surprise, and feel free to use the order form, or just send me an email with your request, and I'll give it my best to make you the best soap experience you've ever tried.